Innovative research by the National Physical Laboratory (NPL) and the University of Bradford used laser microscopes to explore how stone tools were used in prehistory, and the process has helped streamline surface measurement techniques for modern manufacturers. The analysis of stone tools is a key factor in understanding early human life including social organisation and diet. 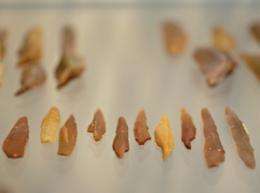 Archaeologists at the University of Bradford hypothesised that reconstructing past activities was the best way to study what each tool was used for. They proposed to measure the surface structures of replica stone tools before and after they were used in different reconstructions on two natural materials - antler and wood. NPL conducted surface measurement investigations on the replica tools using a confocal microscope to create a map of surface structure. Richard Leach, who led the work at NPL, said: "We measured the surfaces of each tool using a confocal microscope to create a map of its surface structure. Optical measurements create 3D constructions of each surface recorded without physically contacting the surface." The measurements taken by NPL on each tool before, during and after wear experiments revealed variations in the surfaces that can be used to predict the use of the tools. The results offered interesting insight into the breadth of future experiments necessary to provide conclusive results on the use of stone tools in prehistory. These measurements also formed part of a development process for new instruments being used in a wider NPL project to support all aspects of manufacturing: from turbine blades to grinding machines to mobile phone screens. NPL has produced a range of equipment which allows the manufacturing world to gain a better understanding of surface topography, without using stylus instruments - which have proved slow for in-process applications. NPL has worked in conjunction with the International Organization for Standardization (ISO) to develop the use of optical systems to conduct areal surface measurements, including instrumentation, calibration artefacts, good practice guides and reference software. More accurate surface measurements allow manufacturers to revolutionise designs of existing and developing technologies, for example by controlling how the surfaces glide through air, absorb or repel water, or reflect light. Richard Leach said: "Greater accuracy and more intelligent use of areal surface measurements impacts outputs such as improved fuel efficiency or the intelligence of touch screens. Using new ways to conduct surface measurements provides the opportunity for businesses to meet consumer demand for better quality and more streamlined products."